Sundays is about catching little chit chat coffee moments. That day where I love to get up with sleepy eyes, a good coffee and endless magazine reading. When it's only about catching time to relax and enjoy. So no better place there could be than this sweet little kitchen. 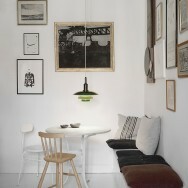 Styling has been done by Lene Ronfeldt for Louis Poulsen. 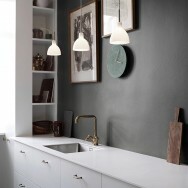 A Danish kitchen interior where the goodness has been set through shades of dark grey, brown, green and black. 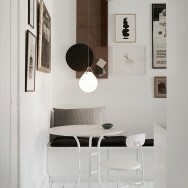 Adding only but admiration for the neutral decoration details and the subtile lighting fixtures. Perfect styling!